What happens when you combine the efforts of two of Sanford's top, most creative and inventive chefs, and then add in the talents of one of our best craft cocktails bars? It's a veritable gastronomic explosion. That's what I experienced recently, along with nearly 50 others, equally as fortunate as I was to partake of this fabulous event. Chef Josh Oakley of The Smiling Bison and Chef Nat Russell of The Tennessee Truffle combined their talents and efforts on a recent Tuesday night and pulled off one helluva great collaborative dinner. And to add to the food, Bitters & Brass paired each course with a low ABV craft cocktail. What a fabulous dinner it was. 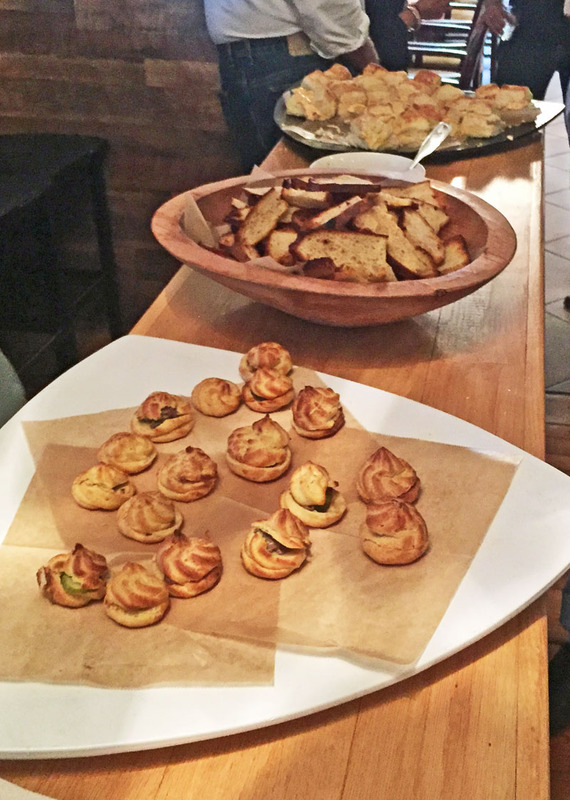 We started with some hors d'oeuvres, in the bar area of The Smiling Bison, which hosted the event. There were a number of nom-nom thinks to gnosh on, and I tried them all. The perfideral with pickle was quite unusual. I had a homemade chip with what seemed to be a sort of salsa, perhaps tomatillo--but whatever it was, it was simply delicious. Some bruschetta was served, and also some pimento cheese sliders--messy but oh so yummy. Unfortunately, I devoured mine before I could snap a photo, but my tummy sure remembers the great flavors. 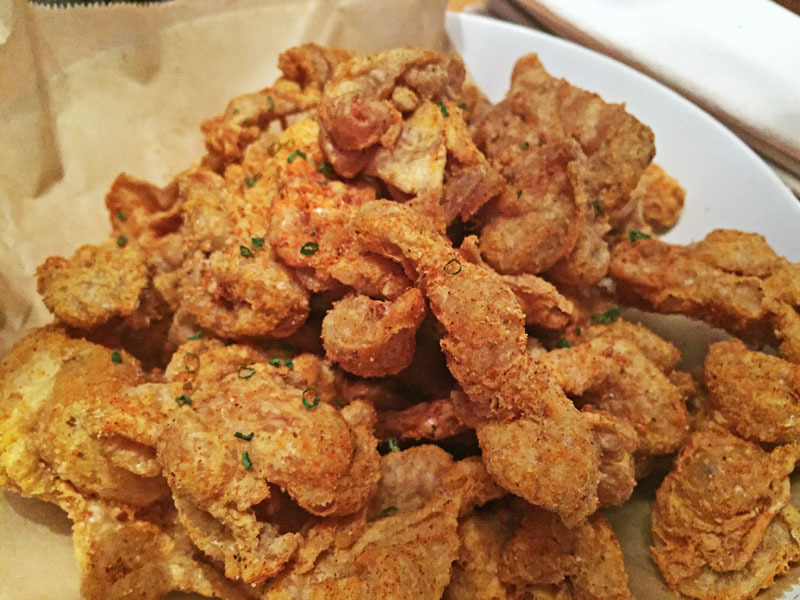 If you've never had deep fried chicken skin, you do not know what you're missing. It's along the same lines a deep-fried pork rind, but with a nice chickeny flavor. They were ever-so-lightly seasoned, light, airy, crisp, and full of flavor. I could eat these all day, and I'm not a big chicken skin fan--or wasn't until I tried these. There was also a nice, refreshing, lemony type of cocktail to go along. What a great start. About 7:30 we sat down (it was a full house at "The Bison") and began with our first course (pictured above), courtesy of Nat and The Tennessee Truffle: Watermelon & Fish. But this isn't at all what you might suspect. Light, cold, flavorful, it was a snapper ceviche with avocado puree, watermelon radish, compressed watermelon, pickled watermelon rind, watermelon sorbet and mint & lime caviar. What a taste explosion in my mouth. First there was texture. From the cold crunch of the radish, to the smooth creaminess of the avocado puree, the flavors melded great with the soft texture and flavor of the ceviche. Each bite was wonderful and an explosion in my mouth. The dish was paired with an Airmail: jamaican rum, lime, honey, and topped with bubbles. It was a match made in heaven. The second course was from Josh and The Smiling Bison: Country Pate (pictured above). There were so many great bites during the course of this evening that I can't pick out only one highlight, but certainly the terrine along with the mustard was one of my favorites. 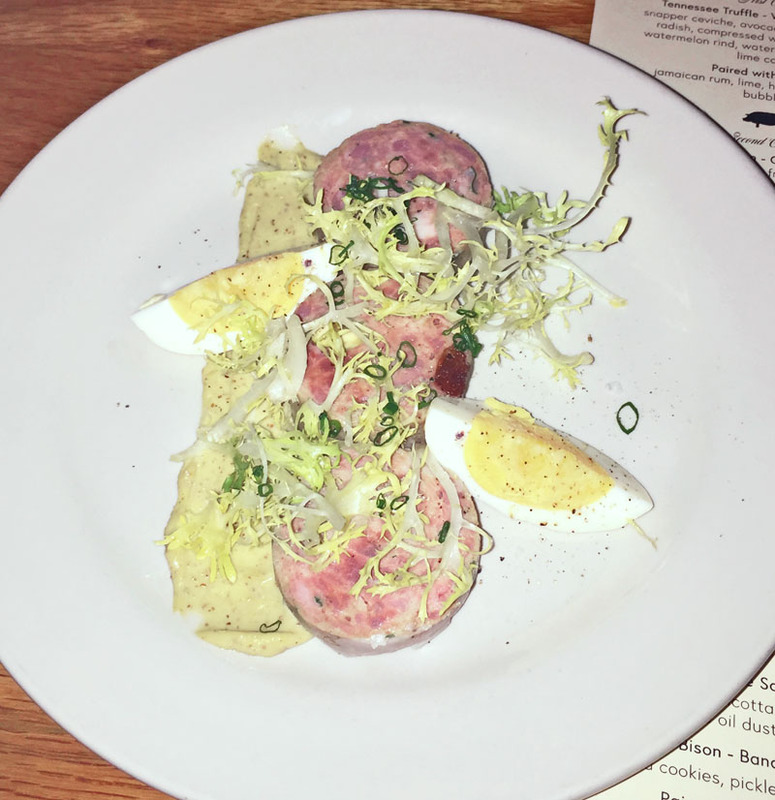 This dish was a pork & duck terrine with frisee, pickled egg, mustard, and a pistachio vinaigrette. Well done! As with the first course, each bite was wonderful. I especially enjoyed the rich, savory smoothness of the pate as accompanied by the acid of the mustard, a great pairing. The frisee gave a nice crunch and texture, and the egg was a great counterbalance. This course was paired with Old Tom Cat: old tom gin, curacao, cappellitti sfumato, lime, and orgeat. While I'm not even sure what all those ingredients were, I know they were one thing in this combination, and that is tasty. Another hit course. Two down, three to go. 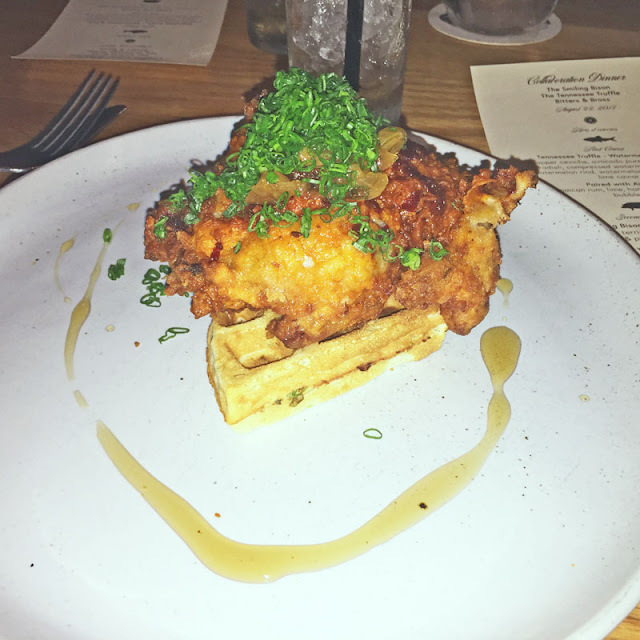 The third course (pictured above) was the work of Nat from The Truffle: Nashville Hot Quail, quite a nice play on chicken and waffles. Once again, a dish perfectly executed. Sitting on a buttermilk scallion waffle was a perfectly done, crispy yet tender portion of quail, served with a bit of golden raisin and onion chutney (providing a nice balance to the savor quail), garnished with some chives, and served along with some smoked maple syrup--for the waffle of course! Once again, a well-executed, flavorful dish. The quail was quite good, nice and juicy, and the exterior nicely browned and crispy. The waffle was tender and about the best waffle I've ever had. This was paired with Missippii 1907: cathead honeysuckle vodka, ransom's dry vermouth, lemon and sweet tea syrup--another hit and a great pairing. This course was another hit. Three in a row! Josh from The Bison was the chef for course number four (pictured above): Sweet Potato Tortellini. Just to look at this dish, you have to know that (at least for me) the highlight was the huge BBQ shrimp. OMG, it was absolutely fantastic. 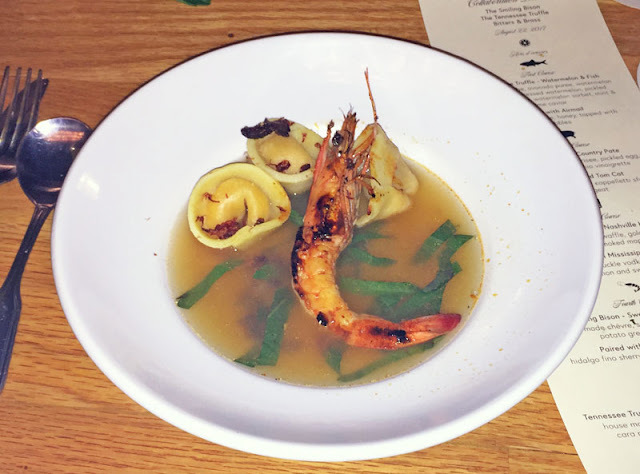 I'm a huge shrimp fan and this baby was cooked perfectly, swimming in a nice smoked ham broth with some sweet potato greens--I never considered that you could eat the greens of a sweet potato, but they were a good compliment to the broth. And of course there were the tortellini. The sweet potato filling was excellent, sweet and yet not overly so. I did think the pasta was just a bit too al dente for me, and maybe a bit thick, but still, this was a great dish overall, with flavor and presentation top notch. I enjoyed each bit of the shrimp, and each sip of the broth. Course #4 was paired with Bamboo Cocktail: hidalgo fino sherry, dolin dry vermouth, and orange bitters. Again, a great pairing and nice compliment to the food. Another hit for the fourth course, four in a row. Can they keep it up? The answer is, yes. Course number five, dessert, was a real collaboration. First from Nat and The Tennessee Truffle we had Orange Scented Olive Oil cake. And along with that, from Josh and The Smiling Bison we had Banana Pudding. Neither of these was ordinary, and both were extraordinary. 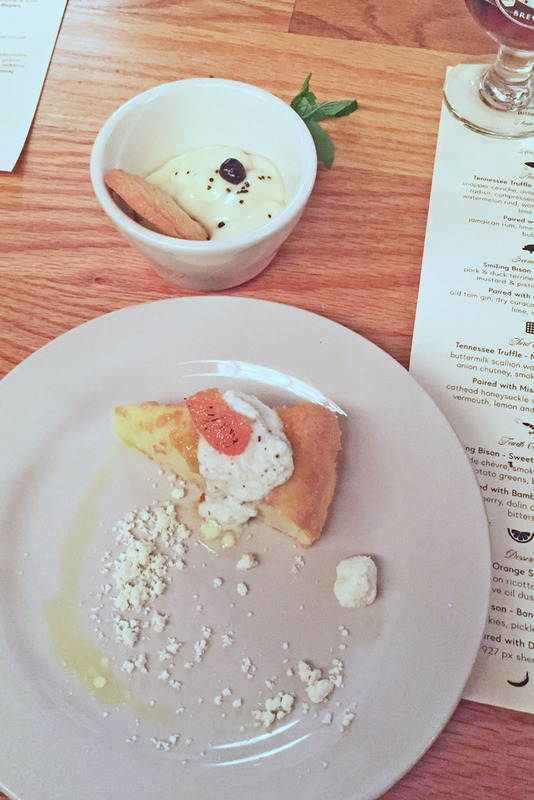 The Olive Oil cake was tender and buttery and moist--it smelled as great as it looked, and tasted amazing. With house made lemon ricotta, caramelized cara cara navel, olive oil dust and fennel pollen, it was an exquisite, tasty, sweet but not overly so dessert, quite a hit. And the Banana Pudding was anything but ordinary, served with some pickled blueberries and a vanilla cookie. It was so good I wanted to lick the bowl! To go along with dessert, Bitters & Brass paired some alvear solera 1927 px sherry & Amaro lucarno. Not sure what all that is, but I am sure that it was good. Five courses, five hits. OMG, I felt like I died and went to heaven. Of course the wonderful dining experience was made complete by excellent front of the house service, led by Ron Thomas of The Smiling Bison. Courses came and went, dishes cleared, drinks delivered and picked up, silverware refreshed as needed, all was taken care of efficiently and quickly. This was really an excellent event, a great collaborative dinner with great food and a great pairing with some fine craft cocktails. When you add tax and tip to the $65 price tag, you might think it a bit expensive, but let me tell you this, you absolutely get what you pay for and this was by far perhaps the finest dinner overall that I've ever had. Everything--and I do mean everything--was top notch, from the first bite of an appetizer to the last licking of the banana pudding. The low ABV cocktails were great, and a great idea to keep them low ABV--that too made the dinner so much more enjoyable. All the folks we ate with agreed that it was great. Afterward we visited with a few more, and all we could do is marvel at the wonderful experience we had. It was about 3 1/2 hours well spent, and I'd do it again in a heartbeat. I'm a huge fan of both chefs, Josh Oakley of The Smiling Bison and Nat Russell of The Tennessee Truffle. I eat at both their restaurant often, and have never, ever left disappointed. Some of the best stuff I've ever put into my mouth have been at those two establishments. 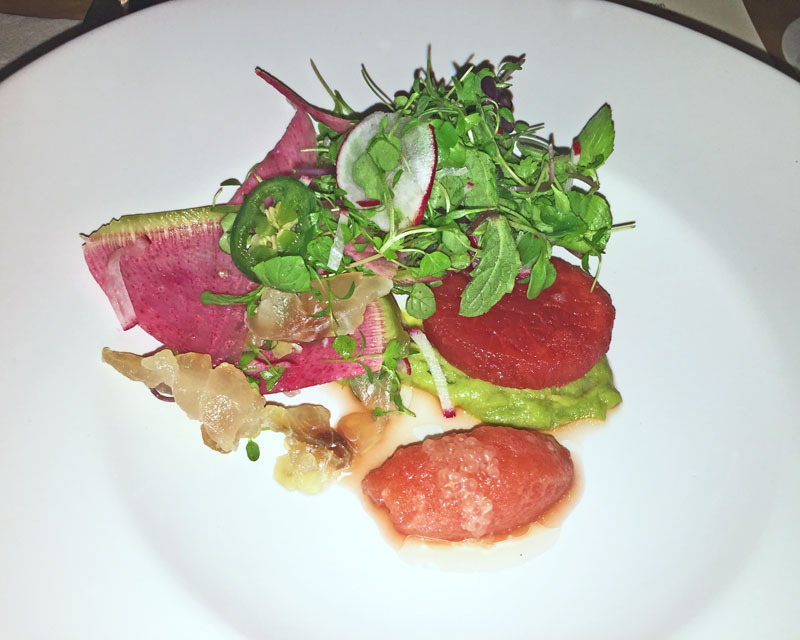 I remember fondly the wonderful Beet Salad from The Bison, and the Pickled Shrimp from The Truffle. But the Collaborative dinner was a cornucopia of the most excellent food I've had, all in one dinner. Did I sort of like it? Hell, yes! I hope they do it again, and soon. Sign me up, no doubt! The District is the newest addition to historic downtown Sanford's growing dining scene, and a welcome addition. They opened quietly in March 2017 and I've seen good crowds in there many times since. We ate there twice, first just a few days after they opened, and secondly a few weeks later. 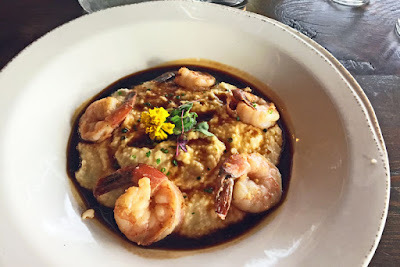 The first bite I put into my mouth at The District was the Shrimp N Grits. It was a good choice. The shrimp were cooked just perfectly. The cheesy grits with bits of andouille sausage were really among the best cheesy grits I've had, and tomato demi glace gave a wonderful, slightly acidic balance to the grits. The shrimp themselves were very tasty, though I did think the portion a bit meager--there were only 5. I have since seen a Facebook post of this same dish showing 6 shrimp, so maybe they changed that since. However, the dish itself was outstanding, so good. 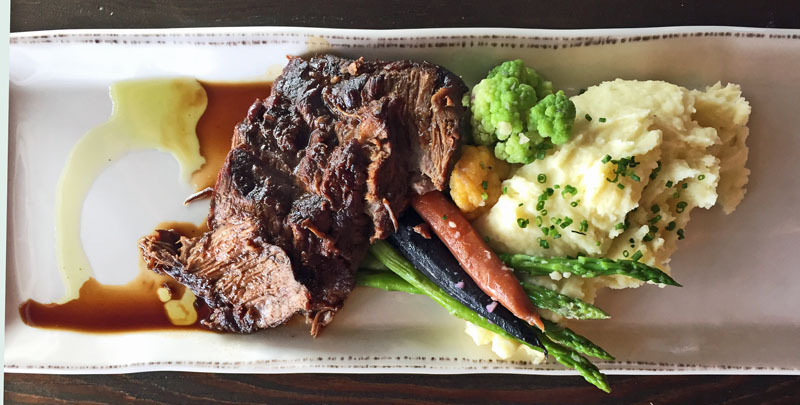 Tommy chose the Braised Short Ribs, and they, too, were a hit. Though the menu says "no substitutions," he asked if he could get potatoes instead of the mushroom risotto--the waiter checked with the chef and was told "no problem." That's great service. The beef itself was very tender, juicy, and full of flavor, served with a rich demi glace. The veggies were a nice mix of crisp-tender carrots, broccoli, and asparagus. The potatoes were really, really good, like top-10 best mashed potatoes ever. The plate was ready to be licked clean when done, it was all that good. On our second visit, we decided to try some of the appetizers. 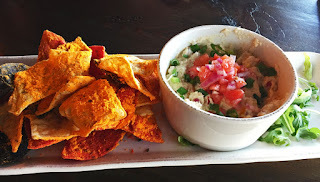 We began with the Chicken Dip, which we'd heard lots of good things about. Everyone who raves about this was right, this was very good. The slightly warm chicken dip is a mixture of cream cheese, parmesan, red onions, sour cream, peppers, green chilies, grilled sweet corn, and green onions. It is cream, rich, and flavorful. Then when you put it on a homemade dorito, the flavors and textures explode in your mouth. Talk about good, this is really way up there in appetizer-land, we'd order it again in a heartbeat--and I'm sure we will next visit. Tommy went for the Potato-Leek Soup and it was a good choice. The soup was a bit chunky, which was nice, but still rich and creamy. You definitely tasted the potato and the leek, they were the stars of the dish. You notice the two spoons in the picture? 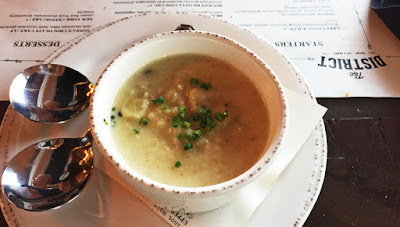 Yes, i had a few bites of this soup and agree, it was wonderful and I'd definitely order it again! I chose the Tuna Tacos. The presentation, as you can see, was awesome. The sriracha sauce, in faux-asian lettering, was sprinkled with black and white sesame seeds and was a unique way to present the dish and add a user-controlled portion of sriracha. The ahi tuna itself was very good, and even with the accompanying coleslaw of napa cabbage, daikon radish, cucumbers, sesame oil, and wasabi ponzu, the flavor of the rare tuna came through loud and clear. The taste of all the components, as well as the various textures of crisply and creamy, all worked well together, and made this a wonderful taste explosion. I also thought the portion--three tacos--was perfect for the price. If I had one minor compliant, it was that the flour tortillas were just a bit hard and dry--I'm not sure that's a problem easily solved. But overall, it was a very good dish and I'd order it again. 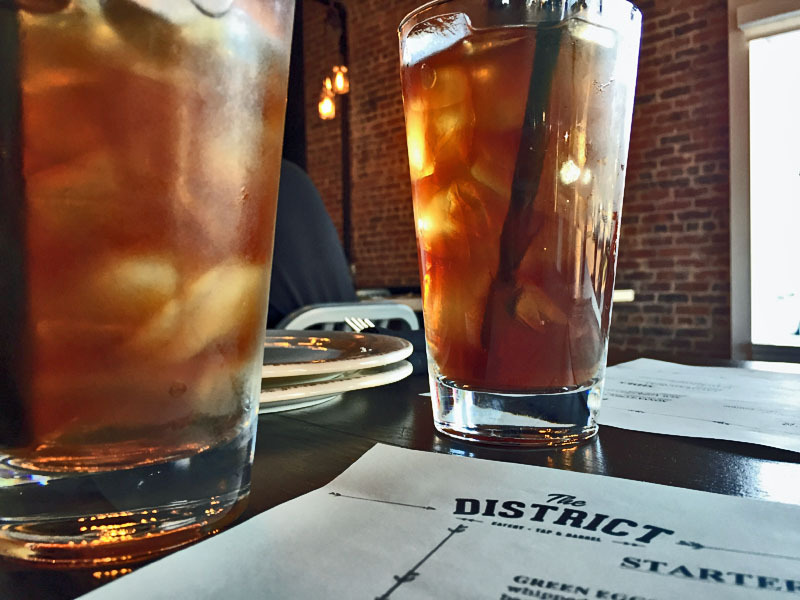 The District is a beautiful space, a remodelled old building in Sanford's Commercial Business District. The are the second gastropub in downtown and feature a beautiful bar, craft cocktails, and nicely transformed setting. Their opening took a lot longer than planned, and I understand it took a lot of hard work, including removing/redoing the concrete floors and all-new plumbing. The are basically set up as two connected rooms. On the left is a dining area, and on the right is the bar area, with the kitchen presumably behind the bar. We sat in the bar area both times. Our service was good and for a newly opened place, I was surprised and pleased by the lack of any major issues. Both times one of the owners was around to check on us and chat, that was nice as well. I'm sure we'll be going back again and again--there are a few more items on the menu I want to try. They also have a different, lunch menu, which I've yet to try--that is on my "do it soon" list as well. I heartily recommend The District. Give it a try and let me know what you think! It was a chilly Saturday afternoon in late January when we decided to give Ricky's Chicken a try. Only open a few weeks, I'd heard some good things on Facebook, and saw some pictures of food that made me want to try it. I'm glad we did. The lady behind the counter was very friendly and knowledgeable and quite helpful, since this was our first visit. Upon viewing some pictures of some of the dishes, and upon the recommendation of Ricky himself, we decided to share two things. First up was the Salchipapa, pictured to the right. As we later learned from Ricky, this is a traditional dish from Ecuador and Columbia. 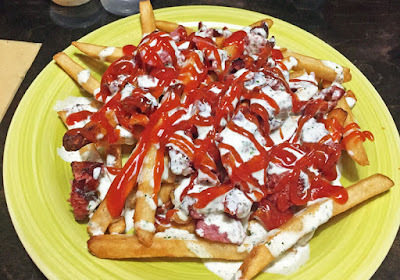 It is french fries topped with a mild smoked sausage, and then drizzled with both a fresh crema and some ketchup, which is also doctored up a bit. This was very, very good and we cleaned that plate. The fries were nice, thick cut, traditional skin-on fries, perfectly cooked. The sausage was very flavorful but also quite mild. What really pushed this over the top was the house made crema. I'm not sure what all was in it, but it had a very nice mild flavor, a bit of basil, maybe some buttermilk even, but it was oh, so tasty. And the ketchup added the little kick this needed. Next we shared a half chicken. The chicken is rotisserie cooked, and it came out right out of the rotisserie. The skin was nice and crispy, and the chicken itself quite tender and juicy, full of flavor. I had the dark meat and a bit of the white, and it was very good--even the white meat was tender and juicy. It was served with white rice, black bean, and plantains. The plantains were nice and sweet and the black beans were pretty traditional black bean--put over the rice they were very tasty. We cleaned up the plate and got every last bit of tasty meat off those bones! And by the way, at $7.20, I thought this to be an excellent value. 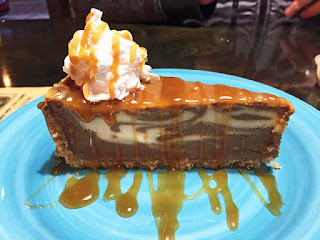 We were done eating when Ricky checked in on us and as we chatted just a bit (and before he knew I was a food blogger), he offered us a complimentary slice of his house-made Salted Caramel Cheesecake. Wow, we were surprised, first by the offer (it was his last piece, he said) and then by the taste. It was superb! Now, I am not a huge caramel fan, but this was way good. The slight hint of salt with the sweetness of caramel and cheesecake made an excellent combination, and those flavors did quite the happy dance on my tongue. I also managed to get a picture of ricky with his cheesecake. After we were done, we chatted a bit more and I gave him my blog card. I learned that Ricky immigrated to the US some years back. He started out in fast food and some chains, then went to culinary school. More recently he worked at several well known area restaurants. 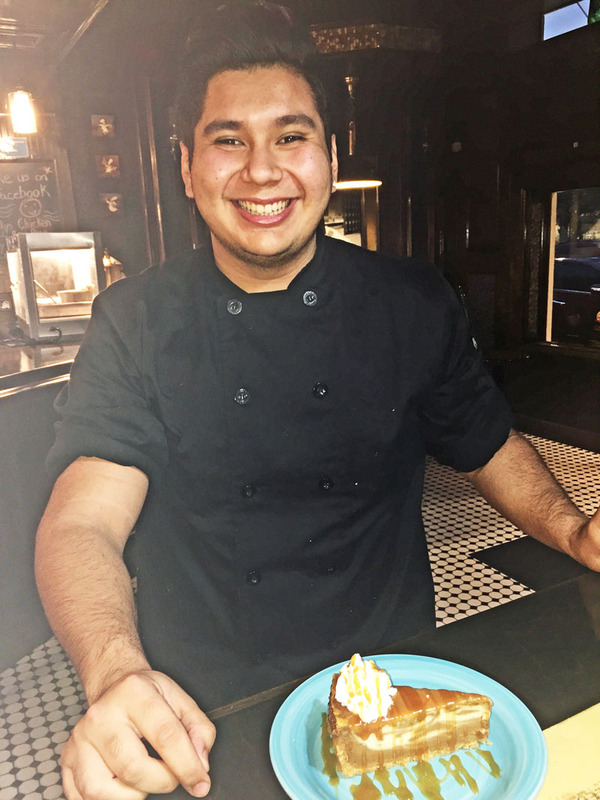 But his real passion is to do his own thing and when the opportunity to open in this Sanford location came his way, he jumped at it. It's a lot of work, he told me--long days, very long days. But he enjoys it tremendously. I'll say this, he sure had a lot of youthful enthusiasm and a passion for his food. If this first visit is any indication, the food he creates will certainly bring him success. By the way, I want to go back for his pulled pork. While we were waiting for our first dish, he brought us out a sample of his pulled pork. It was excellent, tender, juicy, and with a nice mouth-feel--this was the real deal pulled pork, pure and simple. I can't wait to go back and try that as pulled pork is one of my favorite dishes. 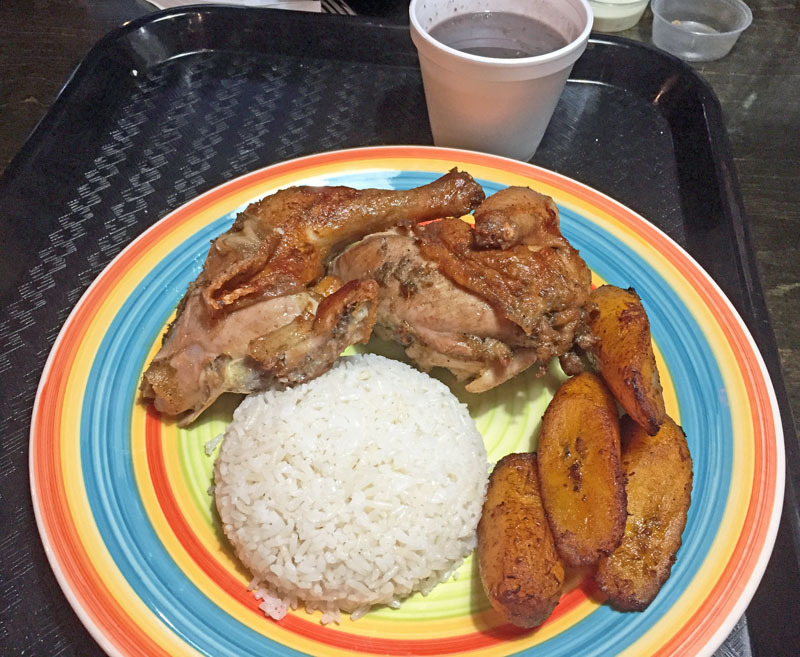 Our experience at Ricky's Chicken was great. He is an outgoing and passionate young man and put out some very good food. I sure wish him continued success in this location. It's right in the heart of the Sanford nightlife area, and there is some competition, but it seems a great place to go for a bite or some quick take-out, even late at night. I highly recommend you give it a try, and leave me a comment below as well.